Yes, I understand quite well the untimeliness of this post, as most of us are still experiencing stormy, snowy conditions and even a Polar Vortex or two. In fact, as I type this post on my computer, the snow is falling serenely outside of my window, erasing the tyre marks of the cars that have passed not too long ago. The footprints of the committed joggers have all been covered up again and still it falls; silently, beautifully and innocently. So, back to this sherbet. I know, I know, it’s totally inappropriate for these winter days but I couldn’t resist the blood oranges. They make my heart sing when I see their beautiful colour in all the dreariness of winter. I don’t know about you, but I can eat ice cream in spring, summer, fall and winter. Ice cream does not have a season in my books and in my house! Sometimes, I think we go through more ice cream during the winter months than summer. That being said, here is a Blood Orange Sherbet. Of course, considering blood oranges are in season now, this is really the only time we can make this. If you don’t want to eat it straight up, make a float out of it like we did or throw it into your daily smoothie. It is delicious either way. Besides, the colour alone will lift your spirits and you’ll be just happy looking at it. So, whether you make it to just gaze upon when you’re feeling blue or actually eat it, it’ll bring joy to your senses regardless. Creamy and refreshing blood orange sherbet made with fresh blood orange juice and cream. Place all the ingredients except the milk and cream into a bowl of a food processor and mix until the sugar is dissolved. Place in the fridge until the mixture is chilled, at least an hour. Pour the mixture into your chilled ice cream bowl and follow the directions of your ice cream maker. Turn the machine on and churn for about 20 minutes or until the sherbet is like soft serve ice cream. Scoop out into a freezer proof container and chill until nice and firm. Serve as is, with fruit or on top of a float. You need about 12-13 blood oranges and they are messy to juice! Thought I'd warn you since I made a mess :), it's worth it though. Hope you’re having a great weekend, so far. The weather did throw a wrench in the plans but it’s nice to stay home and catch up on reading and recorded shows. Stay warm everyone, and have a great week! Oh MY GOODNESS! That looks so so so beautiful! It is a very timely post. I have some blood oranges lying about and this is where they are being made into. What a fantastic colour it is. Looks delicious, especially in the glasses! The thought of ice cream in winter always puts me off, but when I stop thinking and just eat it I always enjoy it 🙂 What incredible colour you got from those blood oranges – beautiful! I love blood oranges – they are only available for short season, but the color of oranges are just so beautiful! What a great way to enjoy blood orange! The color of sherbet is amazing… so pretty! Love the vibrant color – just what I need to see right now to brighten things up! And love the float. : ) Floats are very popular at my house. Dear Nazneen, blood oranges are hard to beat – and your Blood Orange Sherbet looks fabulous – winter or not, this is certainly a treat not to be missed while blood orangres are still in season! Yes, it may be cold outside and snowing even as I type this but when the sherbet looks this good, I say, “What weather?” I’ll put on a sweater and have another bowl, thank you very much. If the ice cream is good, it has no season. Bring it on! Have a great week, Nazneen. Freezing temps or otherwise, nothing can stop me from devouring this deliciousness! Gosh, that looks fantastic. I’ve got the most annoying cold right now, and this looks like a great way to ingest some vitamin C ;). It was so cold over the weekend. But that doesn’t mean I wouldn’t have eaten this sherbet. This is a work of art, Nazneen. My mother used to let us eat sherbet when we were sick. The rainbow kind. I’ve made ice cream but never sherbet. This must change and soon! Abbe@This is How I Cook recently posted..Okra Shrimp Bisque – Who Said Okra? In our home we eat ice cream the whole year round, no matter if it’s hot or snowing outside. 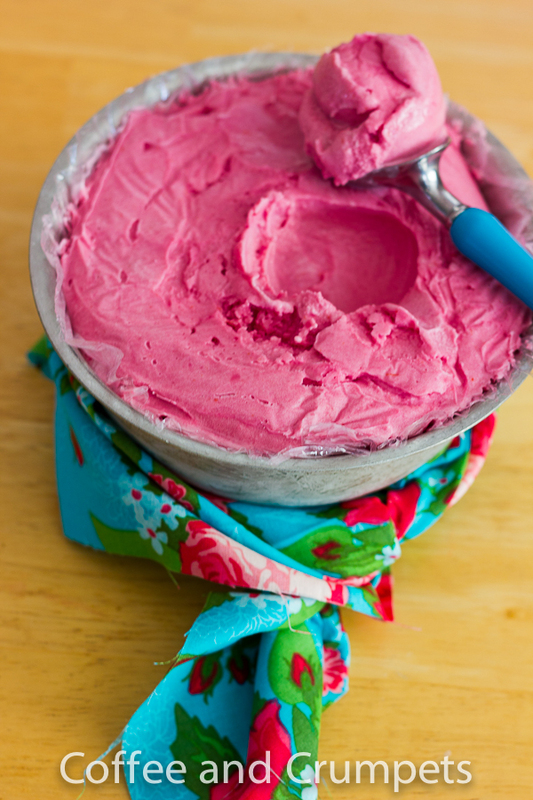 The Color of the sorbet is amazing! This sherbet make MY heart sing! Such a GORGEOUS color! It’s never too cold for frozen treats! I cannot eat ice cream (lactose intolerant) but I can weirdly eat ALL the froyo my heart desires – and sherbet doesn’t seem to bother me either! This is the most beautiful color. Blood oranges are available now in my vegetable maket. I’d love to give this a try. I hope you will link this to What’d You Do This Weekend. It goes live at midnight. Oh Nazneen! I am so glad to know I am not the only one who has been having difficulty in handling an SUV designed to handle snowy conditions. Almost makes me happy. This winter is turning us into weirdos, and this drink actually reminds me of summer. It really really does. And we do run through a lot of ice cream during the winter as well. Maybe something to do with that hangover of summer……this drink is beautiful! Here I just posted a stew recipe and you’re posting sunshine. I’d much rather be looking at this than Winter food. C’mon Spring. Beautiful photos Nazneen. It’s snowing here again today, and I need a recipe like this to give me hope that sunnier days are ahead! This looks terrific — thanks. Thank you, John! The colour was really quite cheerful and even though it is cold, I couldn’t resist making and sharing this. Wonderful preparation Nazneen! I really don’t care if it had rained or if it’s still snowing… Seeing your amazing pictures I definitely would love to have this anytime…. As you said, the colour certainly is beautiful and it is indeed very tempting. Thank you Taruna! Some things don’t have a season 🙂 I like ice cream all the time! It does look absolutely beautiful! This week has some warm days, so we will be getting out of winter step by step. Thanks Mariyam! I know it says we have warm days but this is CO, that can change in 10 minutes! What a beautiful color! I love sherbet – that wonderful combination of fruit sorbet and ice cream. I have a few blood oranges on hand, but not enough. Next time I go shopping, though! Thanks, Nazneen! Thanks David! I really loved the colour but I think I got lucky with the oranges. Almost all were a gorgeous colour inside. I’m ready to welcome the new season, even if the weather is not at all, with your sherbet everything appears easier and nearer! … beautiful pictures, beautiful colours!